Click the pdf or ePub 'buy button'. Once paid, look for an email (check your spam folder if necessary) with a link to download the file. This is a book for planners, policy-makers, project managers and team leaders working anywhere outside the commercial sector. It's a guide to visioning, planning, funding, starting, running, sustaining and reporting on an effective innovation initiative. All IFF publications are illustrated by Jennifer Williams. Her engaging, intimate and original illustrations are an essential part of IFF's narrative and message. ﻿Innovation is a necessity in a changing world. But what kind of innovation? 'Sustaining innovation' props up and temporarily fixes structures and processes that are failing – making them cheaper, faster, safer, more efficient. 'Disruptive innovation' shakes things up. Typically however disruptive initiatives offer only short-term impact or are eventually adapted and ‘mainstreamed’ to help sustain existing systems. That is particularly true in the public, social, cultural and civic sectors where the natural patterns of renewal that have been developed in market settings (creative destruction, sophisticated financial support etc.) are generally absent. Only 'transformative innovation' can deliver a fundamental shift towards new patterns of viability in tune with our aspirations for the future. Supporting: how to develop systems and structures to support a culture of renewal in our public, social and civic systems. It concludes with an invitation to join a growing community of transformative innovators around the world – a network of hope in powerful times. ​From a review by David Lorimer in Network Review - Journal of the Scientific and Medical Network. "This inspiring book was launched in Edinburgh in April at a reception to mark the 15th anniversary of the International Futures Forum and it represents an excellent summary of many of its key insights into social and learning processes over this period. 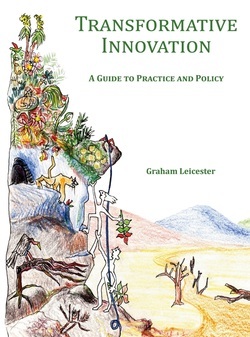 Transformative innovation represents a ‘fundamental shift towards new patterns of viability in tune with our aspirations for the future.’ This contrasts with sustaining innovation that fixes the existing system and disruptive innovation that shakes it up. Following the introduction, the book consists of six chapters on knowing, imagining, being, doing, enabling and supporting. It outlines 10 characteristics of transformative innovation derived from IFF praxis: balance, in terms of operating in both the old and the new world; inspiring and hopeful; informed by a longer term perspective; pioneering a process rooted in discovery and learning; grounded; personally committed with our full self; responsible; revealing hidden resources; maintaining integrity and coherence of means and end; and maintaining a pioneering spirit even in the face of success. At this point, the reader will find a useful analysis of the evolution of a more adaptable way of providing care and support to old people. ... Pioneers in every field will find this book a rich resource." "This a quiet and reflective book, and in both length and tone it is a refreshing antidote to the hundreds of over-excitable business books that are at heart vastly padded articles. When reading Transformative Innovation, you have a sense of the depth that sits behind every chapter. You can also pick up the tools and use them in your own practice, especially because the IFF, with its strong commitment to openness, has published much about them both on its own website and through an associated project, H3Uni.org. This rich and humane book should be on the shelf of every practicing futurist. " Drawing on International Futures Forum's 15 years of experience in supporting transformative innovation around the world, this is a practical guide particularly directed to individuals and organisations in the public, social, civic and philanthropic sectors.